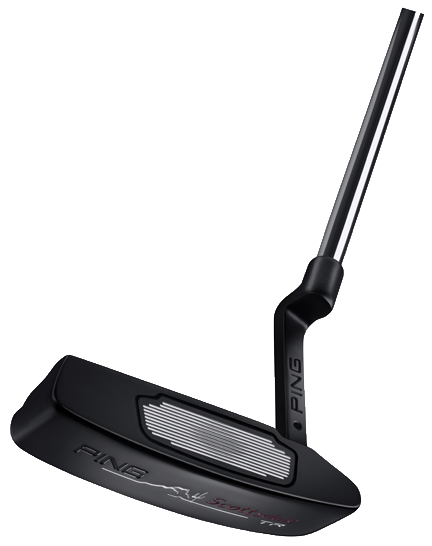 PING Golf is best known for its putters and has been a leader over the years in putter innovation, both in design and materials. The latest is the Scottsdale TR Adjustable Length Putter series. TR stands for True Roll which is what the company says is produced by the variable-depth grooves of the in the insert. Grooves are deepest in the center and get shallower towards the edge and according to their testing this gives almost identical ball speeds across the putter face and therefore more consistent distance control. PING studies show an increase in ball-speed consistency, measured at nine points on the face, of nearly 50%. The insert is made from a lightweight 6061 aerospace-grade aluminum that provides a solid feel and sound and the finish is a non-glare black PVD with white sight lines. The Scottsdale TR is also may be adjusted for length to suit the user, from 31” to 38” in standard models where it is an option; belly models 37.5” to 46.5”; long models 44.5” to 55.5”. 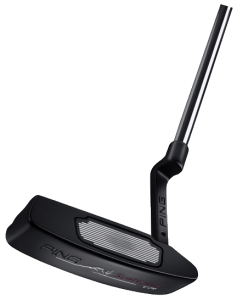 The suggested retail of $162.50 for the Anser 2, B60,Tomcat S, ZB S, Shea, Shea H, Piper C, and Tatum carries an adjustability upcharge of $35. For the Grayhawk and Senita in the non-standard lengths SRP is $192.50 and the non-standard length Anser B and Carefree L are $235.